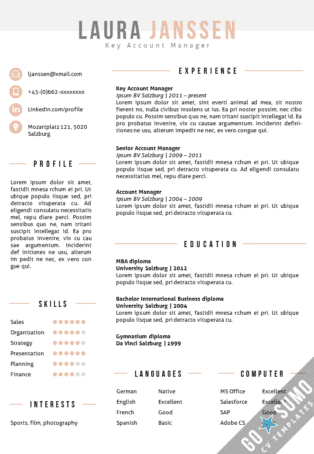 WHY WOULD I NEED A CV / RESUME TEMPLATE? 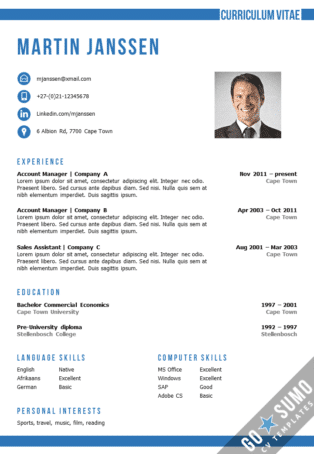 Your cv is often the first impression you make at a job application. Due to the great number of candidates for vacancies nowadays, recruiters often make a first selection of candidates based on just the cvs. 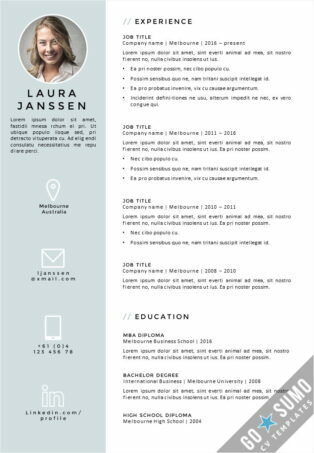 Besides a strong content, a stylish cv helps you stand out and differentiate yourself from other candidates. WHAT SYSTEM/SOFTWARE DO I NEED TO WORK WITH THESE TEMPLATES? It’s best to edit the template on a desktop or laptop computer. Editing on mobile devices is not recommendable. Microsoft Word and/or PowerPoint 2007 or a newer version is necessary to work with the templates (software is not included). We cannot guarantee full compatibility with Pages, Keynotes, Google docs or Ms Word Online. CAN I WORK WITH THESE TEMPLATES ON MY IMAC OR MACBOOK? Using the templates on an iMac or MacBook is possible, but Microsoft Word or Microsoft PowerPoint has to be installed. Note: The templates will not work properly on the Pages or Keynotes programs. 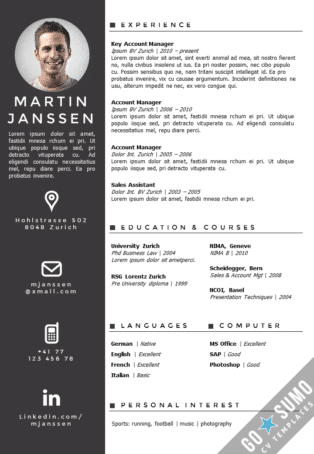 WHAT SKILLS DO I NEED TO WORK WITH THESE TEMPLATES? 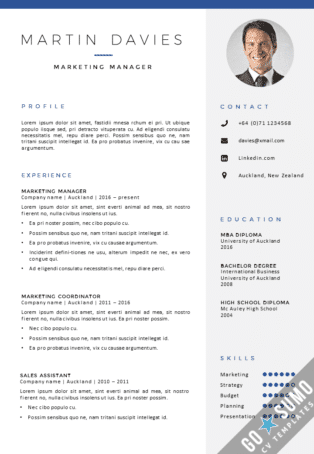 Basic Ms Word/Powerpoint skills are necessary to work with the cv templates. 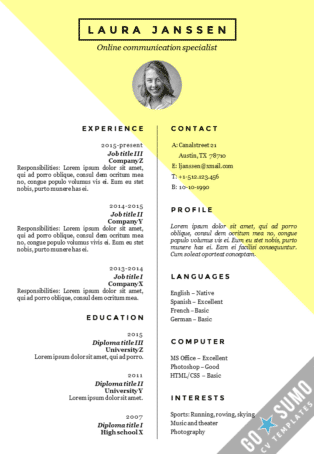 Skills like copy/pasting, working with textboxes, multiple selections. An instruction document with extra tips and instructions is included in the purchase package. 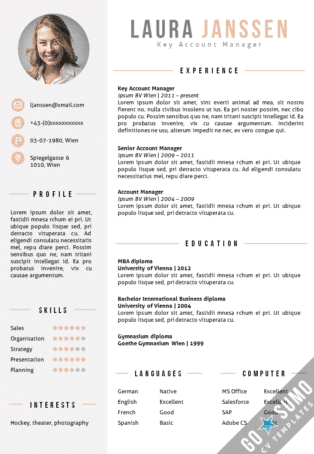 If you have any problems editing the template, don’t hesitate to contact us. We will try to help you with tips as soon as possible. DELIVERY TIME: HOW LONG WILL IT TAKE TO GET THE TEMPLATE? A download link should be available directly after completing the payment. You will see a download link on the final check-out page (return page after PayPal). You will receive a download link in your mailbox as well. If you don’t see a download link on the final check-out page, try refreshing the page. If you don’t see a mail with download link in your mailbox, check your spam filter. If you can’t find a download link anywhere, please contact us via sales[at]gosumo-cvtemplate.com. We will try to help you as soon as possible. You will get the template in MS Word and MS PowerPoint version, both in A4 and US Letter paper size settings. 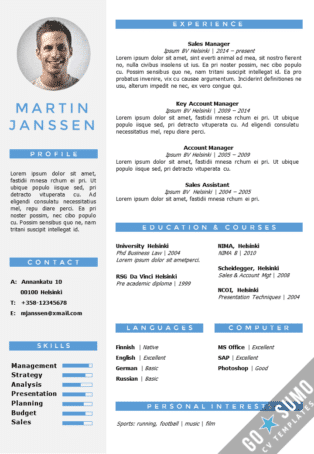 You will also get an instruction document with tips and support for editing the template. For some templates you will also receive a file with links to download necessary fonts. CAN I CHANGE THE HEADERS AND TITLES (TRANSLATE THEM TO MY OWN LANGUAGE)? Yes, the text in the headers can be overwritten and changed into any text or language preferred. CAN I MAKE CHANGES TO THE COLOR SCHEMES, FONTS AND TEXTBOXES IN THE TEMPLATE? Yes, all template are built in open Word and PowerPoint documents. You can change color, fonts, text etc. 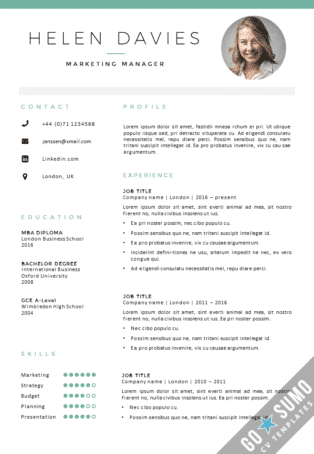 You can even remove, add or reposition complete elements of the cv templates. WHY SHOULD I SAVE A FINAL VERSION AS PDF? 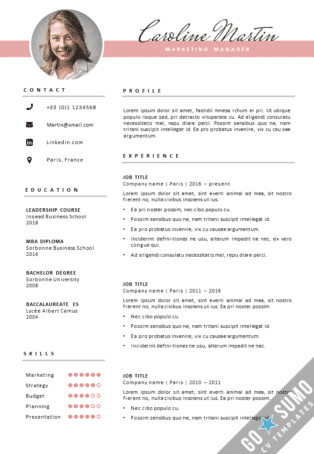 We recommend to save your cv template as a PDF document after editing. By saving as a PDF there is no risk of lost or changed settings when the recipient of your CV has a different version of MS Office. WHY WOULD I USE THE POWERPOINT VERSION? ISN’T WORD THE STANDARD PROGRAM TO USE FOR CV WRITING? 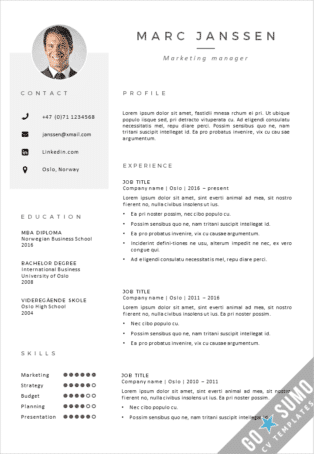 We recommend to save your CV as a PDF document after editing the template. By saving as a PDF there is no risk of lost or changed settings when the receiver of your CV has a different version of MS Office. Because the CV is finally saved as a PDF documents, you are free to choose in which program you want to edit the template. If you are capable of working with both programs, we recommend to use PowerPoint. PowerPoint offers more and easier options for working with graphical elements and textboxes. I’VE BOUGHT A ONE PAGE TEMPLATE, BUT I NEED TO ADD A SECOND PAGE. HOW CAN I ADD A PAGE WITH THE SAME DESIGN AS THE FRONT PAGE? Click on the top left corner of the first page and press Ctrl-V (paste all elements). Do the same on the top left corner of the second white page. PowerPoint: In PowerPoint you can just copy paste the slide in the overview on the left side of the screen. HOW CAN I GET MY PICTURE INTO THE RIGHT SPOT ON THE TEMPLATE? Copy/paste (Ctrl-C/Ctrl-V) your picture to the document. If you are working in PowerPoint you can just pick up the picture and place into the right spot. If you are working in Word you have to position the picture in front of the text first. You can do this by going to “Picture tools/format” on the top menu. Click on “wrap text” and select “in front of text”. After this you can pick up the picture and place it into the right spot. You can also check the instruction document in the Zip file you downloaded for more detailed explanation. I just opened the template file and some of the headers seem to have skipped a line. What is wrong? For some templates it is necessary to download and install extra fonts. You will find a link to the extra fonts and a short note on the installation in the instruction document (see you downloaded Zip file). When the extra fonts are not installed MS Office will automatically replacet he font with a random other font. This can cause the headers to skip a line. I don’t see all cv template files in the downloaded Zip file. Where can I find these files? Can I cancel my order? How is your return policy? Due to the copy ability of the product we can only cancel your order and refund you your money before you download the product. If you have any questions or complaints about the product, please contact us via our contact page, or mail us at info@gosumo-cvtemplate.com . We will always try to help with your questions and offer solutions as best as we can. You can read more about cancellation and our return policy in our general terms and conditions.